Hungry but don’t want to leave the house? A recently added benefit for Amazon Prime members allows them to satisfy hunger cravings with a choice of over 90 metro Phoenix restaurants that are participating in its program to get meals delivered in an hour or less. 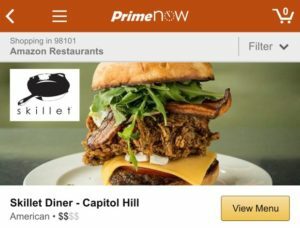 Using the Prime Now App, a member can enter their ZIP code to see which restaurants in their area are part of the program. They also can check out menus, place orders, and track the status of their delivery. Amazon Restaurants commit to no menu markups or hidden service fees with delivery, plus all orders are delivered free to Prime members. Participating restaurants include Angel’s Trumpet Alehouse, Beckett’s Table, Four Peaks Brewery, Mancuso’s, My Big Fat Greek Restaurant, P.F. Chang’s, and The Vig.